Optional (Non-Standard) installation is activities or materials that are outside UniFi Standard Installation. This covers few aspect such as Over the Ceiling Cabling, Conceal Internal Cabling and much more. Customer may deal directly with TM authorised contractors for Non-Standard activities or materials. 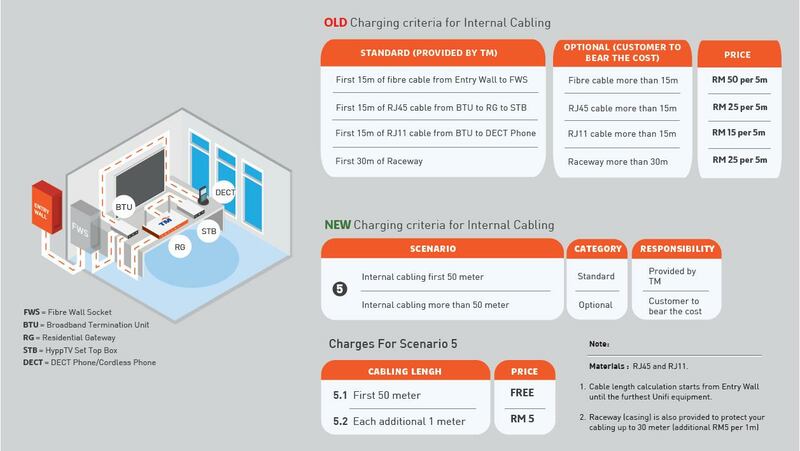 TM have revised the Optional Installation (formerly known as Non Standard Installation) charges for UniFi installation effective on 12th August 2016. However the revised charges will not impact TM promises to the customers to give FREE Standard Installation for any new subscription. With this revision, it will improve customer experience by offering simplified charges for Optional Installation and hence minimize complaints from customers. Below are charges prior 12th August 2016. For details, please refer as in slide as per attached.